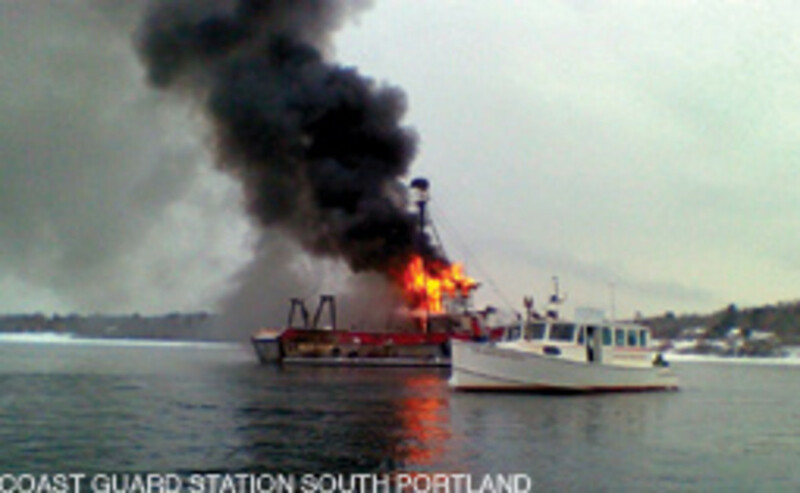 A 65-foot vessel burns Jan. 26 at its mooring near Great Chebeague Island in Maine&apos;s Casco Bay. Coast Guard crews and local responders put out the fire and took steps to minimize pollution. Jan. 23 - Coast Guard investigators monitoring a diesel fuel spill near a terminal in Everett, Mass., have determined the spill dissipated since it was reported. Coast Guard Sector Boston received a report the previous day at around 1:23 p.m., from the Exxon-Mobil terminal that about a 100-foot-by-100-foot fuel sheen was sighted in the Mystic River. Local partners and the Coast Guard responded and conducted shoreline searches into the night to determine a source of the spill. After resuming first-light searches this morning, no source was determined and the isolated spill totaling a few gallons had dissipated on its own. Officials will continue to investigate the spill to determine a source. Jan. 16 - Coast Guard crews medically evacuated a crewman from the fishing vessel Jennifer Anne 115-miles east of Cape Anne, Mass. Coast Guard watchstanders received a report from the captain of the fishing vessel Jennifer Anne that a 53-year old male on board was experiencing chest pains at approximately 3:50 p.m.
An HH-60 rescue helicopter crew and an HU-25 Falcon Jet crew launched immediately to aid the injured man. Once on the scene, the man was hoisted to the helicopter. The man was transported to Cape Cod Hospital and was reported to be in good condition at 8:45 p.m.
Jan. 11 - Coast Guard rescue crews aided three mariners from a fishing vessel taking on water after a collision southeast of Hull, Mass. 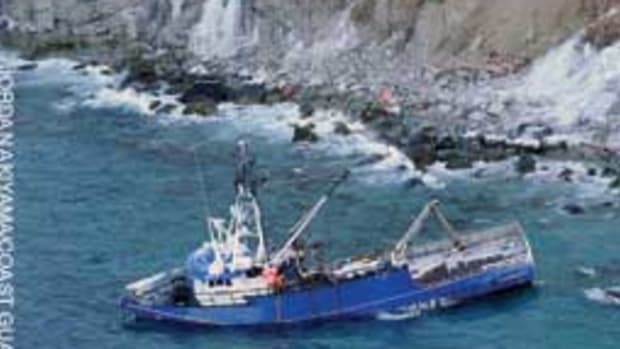 Sector Boston watchstanders received a distress call via VHF channel 16 from the vessel West Bay, a 600-foot bulk carrier, stating they and the vessel Michael Brandon, a 51-foot fishing vessel, collided 20 miles southeast of Hull at approximately 5 p.m. The West Bay reported no damage to its hull, but the Michael Brandon had extensive damage to the bow. Watchstanders immediately issued an urgent marine broadcast alerting mariners in the area of the situation. A Coast Guard HH-60 Jayhawk rescue helicopter crew from Air Station Cape Cod and a 47-foot Motor Life Boat crew from Station Point Allerton diverted to the scene of the collision. The helicopter crew, on scene within 30 minutes, lowered a dewatering pump to the fishing vessel to assist with flooding control. Unable to dewater and repair the vessel offshore, the lifeboat crew took the Michael Brandon in tow. The three mariners and the vessel are in safe harbor near Scituate, Mass. The cause of the collision is under investigation. Jan. 8 - The Coast Guard is looking for information regarding a flare sighted in Georges River near Thomaston Harbor at around 6:30 p.m. Coast Guard Sector Northern New England received a report of the flare from a Good Samaritan on shore. 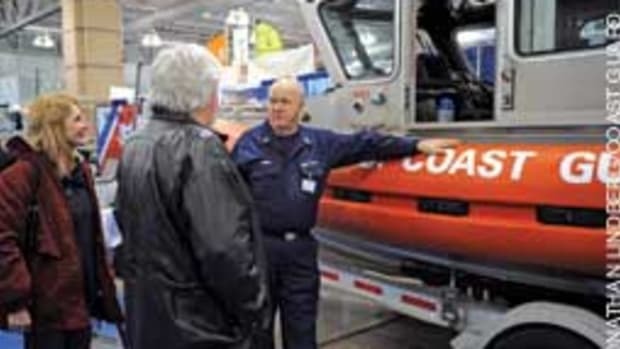 Coast Guard Sector Northern New England is asking anyone who may have friends or family hunting in the area that might have any information to contact their command center at (207) 741-0303. Jan. 5 - An air crew from Coast Guard Air Station Cape Cod medically evacuated a man at 2:46 p.m. from the fishing vessel Sammy Jo 70 miles east of Gloucester, Mass. 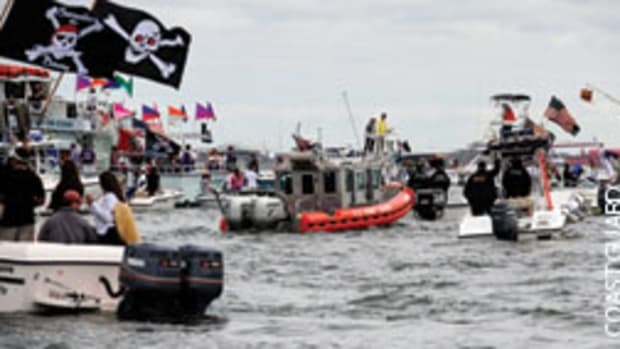 Coast Guard Sector Boston received a call from the Sammy Jo at around 2 p.m., over VHF channel 16 stating that a 55-year-old male crewmember aboard had sustained a head injury two days before and was now experiencing swelling. Jan. 18 - A Coast Guard HH-60 Jayhawk helicopter crew successfully rescued four mariners from the sinking fishing vessel Johanna Lenore, a 76-foot stern trawler, 40 nautical miles south of Montauk, N.Y.
Coast Guard Sector Long Island Sound watchstanders contacted the fishing vessel captain after overhearing a radio distress call at approximately 3 p.m. The vessel reported it was taking on large amounts of water and pumps were unable to keep up with the flooding. All four crewmembers donned survival suits and had an inflatable life raft and an EPIRB. Good Samaritan vessels tried to help the mariners with dewatering pumps. 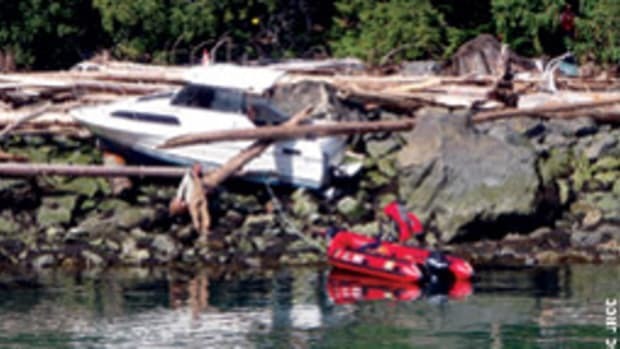 Coast Guard rescue crews arrived on the scene and hoisted the mariners to the helicopter at approximately 4 p.m. 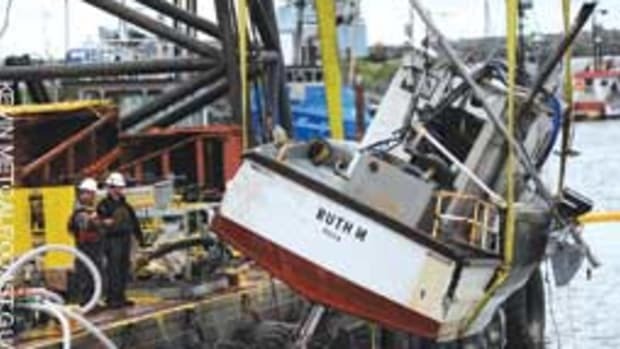 Shortly after hoisting the mariners, the fishing vessel capsized and sank. 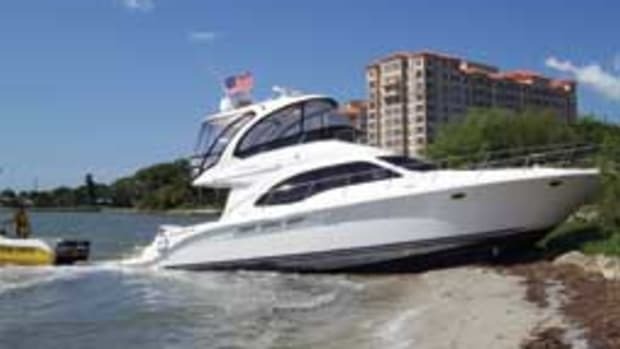 Weather included 20-30-knot winds with 10-15-foot seas. Jan. 4 - A Coast Guard crew and local first responders worked together to rescue an injured tugboat crewmember near Kingston, N.Y.
An engineer aboard the tug Barbara McAllister suffered a leg injury and was stuck in the engine room while en route to Albany, N.Y., in the Hudson River. After successfully getting the engineer aboard the cutter, the injured man was brought to Kingston Point, where he was transferred to local EMS for additional treatment. The Wire is home-ported in Saugerties, N.Y.